JAIPUR, The newest entrant to arrive on the Rajasthani dining scene – Zarin, the Indo-Persian restaurant at Fairmont Jaipur, breathes life into a culinary art that has, over centuries, celebrated the fusion of two of the most ancient cultures in Asia. 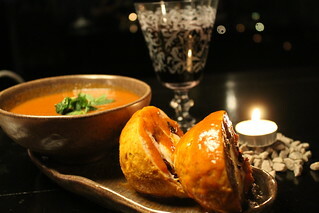 At the helm of this new dining destination, Executive Chef Manpreet Singh takes a novel approach with the use of dominant Indian flavours in his new menu, while paying tribute to the Persian influences of each dish, in order to familiarize the modern day gourmand with traditional Indo-Persian cuisine. Serving as a resilient cultural marker within the royal courts of the Delhi Sultanate in the early 13th century, Indo-Persian cuisine celebrated the symbolic unification of India and Persia; one that began along the ancient spice route, leaving a legacy that has influenced modern day cuisine in India. Carefully crafted culinary offerings form the basis of Indo-Persian dishes at Zarin, each an applaud-worthy combination of flavor, technique and tradition. Dishes such as Iranian Biryanis served along with matzoon (yogurt refreshment) and salad, Atta Raan (leg of lamb wrapped in sour dough), Iranian Haleem (wheat porridge with flavorful meat proteins or vegetables), and Mahi Zameen doz (fresh-off-the-net fish marinated in aromatic Persian spices and gently grilled and then baked), also help highlight a rich cultural landscape stemming from the trade between both civilizations. This exchange of cookery styles and herbs and spices like basil, cumin, saffron and cloves, resonate throughout Zarin’s menu and aptly showcases the culinary styling of both great ancient empires. 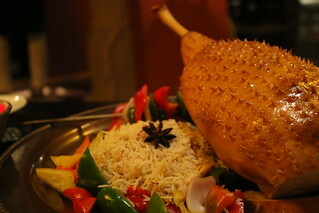 From Sheermal and Bakarkhani – traditional breads to the live tandoor and succulent preparations of Aab Gosht (succulent morsel of lamb cooked with chick peas), Mastava (a hearty lamb soup – an Uzbek specialty) and Tabriz Koftey (juicy chicken dumplings with mixed nuts), meat lovers are spoiled for choice while dining at Zarin. Vegetarian diners will find offerings such as like the Subz Irani (Persian style vegetable stew), Nadru ki Gullar (stuffed lotus stem pods) and Kebab Tokri (a flavorful assortment of stir fried vegetables) with red wine. To round off this ambitious culinary undertaking, desserts such as Baklawa platters (filo sweet pastry) and Badshahi Faluda (vermicelli combined with milk and rose flavouring), are just some of the masterstrokes on the menu that await guests at Zarin. The interiors of Zarin reflect a tasteful rendition of luxury that has been painstakingly crafted from the finest materials. Tucked away in a gilded corner, past a splendidly appointed grand doorway, the Zarin experience unfolds amidst fine crystal stemware, bespoke stone, silver and antique brass tableware, plush seating and opulent teakwood tables (that are specially fitted with tandoors and sigris to keep the dishes warm) – a fitting introduction to the 120 seat restaurant. The dining experience at Zarin can be best described as indulgent owing to the eclectic ambience that complements the food. 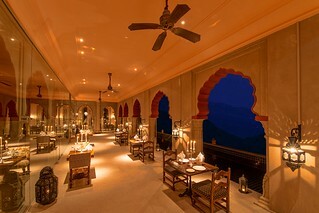 While guests soak their hands in lavish bowls of scented water, strewn with rose petals, awaiting the start of their meal they are serenaded by the sights and sounds of the nearby Emperor’s Bazaar with treasures from the cultural riches of Rajasthan. Folk dancers, story tellers and sufi singers lull diners into a hypnotic trance, as exhaustive selections from the menu appear dramatically on swords and as such, are robust with flavour and history. Fairmont Hotels & Resorts connects guests to the very best of its destinations worldwide, reflecting each locale’s energy, culture and history. Passionate travelers choose the luxury hotel brand for its ability to deliver memorable travel experiences, personalized and thoughtful service, and hotels that are one-of-a-kind. Serving as genuine gateways to their destinations, Fairmont hotels offer locally-inspired cuisine and spirited bars and lounges, distinctive design and décor, and a steadfast responsibility to environmental and social priorities. With more than 65 hotels globally, and many more in development, landmark hotels in the Fairmont collection include The Plaza in New York, London’s The Savoy, Fairmont Peace Hotel in Shanghai and Quebec City’s Fairmont Le Château Frontenac. Fairmont is owned by FRHI Hotels & Resorts, a leading global hotel company with over 110 hotels under the Fairmont, Raffles, and Swissôtel brands. The company also manages Fairmont, Raffles and Swissôtel branded luxury private residence clubs, whole-ownership residences and serviced residences properties. Chef Manpreet Singh Malik wields his knives as easily as he does his wit and charm. A thorough planner and a die-hard food aficionado Chef Manpreet has the distinction of working in some of the most challenging kitchens across the world. 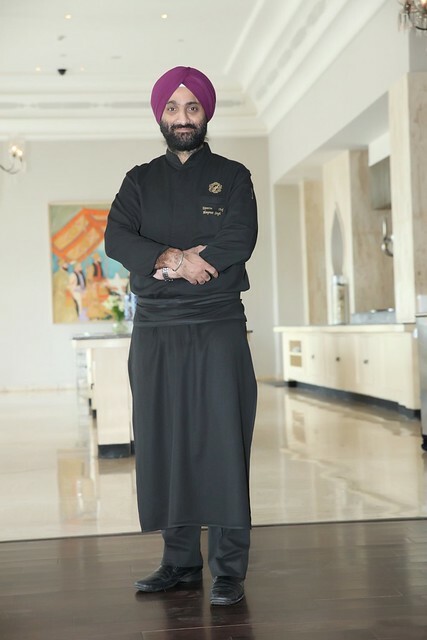 He began his career in the year 2000 in Ludhiana and his culinary journey has taken him across leading hotel chains from England to Bangkok and now back to India at the Fairmont’s flagship property in Jaipur. As the Executive Chef at Fairmont Jaipur, Chef Manpreet will be responsible for firing up the culinary experiences at the hotel and establishing the Fairmont Jaipur as a food lover’s destination. His prowess in the Indian kitchen is legendary as is his ability to lead his team to deliver memorable dining experiences for guests of different nationalities.